Play-Based Early Childhood Education: Are Children Playing or Learning? A Resounding YES! Today, I saw an engineer building a robot, an artist painting a masterpiece, an explorer going into the woods, a mathematician measuring volume and gardener planting seeds. Today, I witnessed a doctor taking care of patients, an athlete running and jumping, a musician singing and playing an instrument, a dancer performing, a negotiator working out a problem. Today, I watched an architect building a skyscraper, a king giving a royal decree and a sculptor manipulating clay. They were all young children doing what they are naturally inclined to do: playing AND learning. Play-based, discovery-based and academic based early childhood programs have been well-researched and documented for decades. The data is in- The data is in- Preschools and Jr. Kindergartens where young children learn through their play and discovery produce the best learning, the best preparation for Kindergarten and school readiness, along with the best long-term benefits. Rather than diminishing children’s learning by reducing the time devoted to academic activities, play promotes fundamental abilities that enable children to learn successfully. In dramatic high-level play, for example, the collaborative planning of roles and scenarios and the impulse control required to stay within the play’s constraints develop children’s self-regulation, symbolic thinking, memory, and language—capacities critical to later learning, social competence, and school success. It is vital for early childhood settings to provide opportunities for sustained high-level play and teachers to support children’s progress toward such play. Because of how children spend their time outside of school, many young children now lack the ability to play at the high level of complexity and engagement that affords so many cognitive, social, and emotional benefits. Effective teachers are intentional in their use of a variety of approaches and strategies to support children’s interest and ability in each learning domain. Besides embedding significant learning in play, routines, and interest areas, active programs also provide a carefully planned curriculum that focuses children’s attention on a particular concept or topic. Further, skilled teachers adapt the curriculum to the group they are teaching and to each child to promote optimal learning and development. High-quality early education is not babysitting while children are running amuck playing (although unstructured playtime is so important too), instead, highly qualified and trained teachers are deliberate in the set up of learning environments where children can make choices, follow their interests, problem-solve, and engage in hands-on, experiential learning. They encourage children to explore and take risks as learners. These teachers understand child development and the stages of development and use developmentally appropriate practices. They provide interesting materials and toys that require children to think, interact, imagine, use and invent, and not toys that do the work where children are passive learners who primarily watch the toy. Teachers create open-ended centers and spaces where children can make discoveries and are allowed time to work and play and pace themselves. Teachers allow time and space for developing real relationships and social and emotional skills. Children learn how to solve problems with one another, how to empathize and how to be a friend. 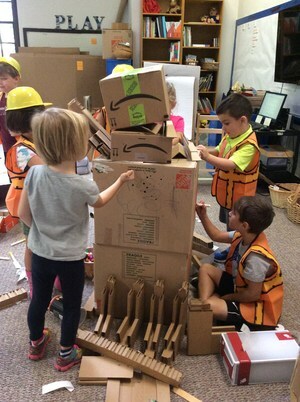 Learning environments where children explore, experiment, inquire and discover through play produce excellent learners and thinkers, not just for today or for Kindergarten, but for their lifetime as learners and people. Tony Wagner, author of Creating Innovators, in his study of highly successful and innovative people, concluded that innovators journey from play to passion to purpose, and parents and schools that promote play (and risk-taking, exploration, creativity, imagination) are foundational in creating innovators. Children who engage in purposeful, uninterrupted and engaged play are not “just playing” but instead are developing their minds, making cognitive gains now and for their future. Play allows for practicing social skills, learning emotional competencies that predict their later success, and building muscles, physical abilities, and body skills. The learning occurs through the play: play is the way they learn about their world, how things work, how things are connected and how to think. I received a class newsletter today where a Kindergarten/First Grade classroom lived this out from the classroom to the playground so look for that blog next week! Until then, go play; it’s ideal for all learners!